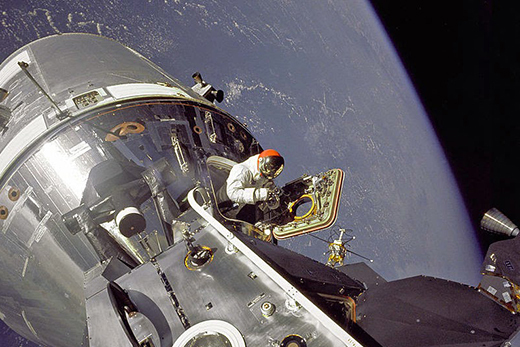 Commander David Scott emerges from a hatch during the Apollo 9 mission. The 10-day flight in 1969 provided vital information on the operational performance, stability and reliability of lunar module propulsion and life support systems. NASA photo. “When I was a kid, I didn’t think flying into space was a big deal. All my friends’ dads went into space,” says Tracy Scott, senior lecturer in sociology and director of Emory’s Quality Enhancement Plan (QEP). The goal of Emory’s QEP topic, “The Nature of Evidence,” is to empower students as independent scholars capable of supporting arguments with different types of evidence. Scott’s interest in the topic was formed while growing up immersed in the culture of NASA. Her father, Commander David Scott, was an astronaut who flew on Gemini 8, Apollo 9 and Apollo 15. He’s one of only 12 people who’ve ever set foot on the moon.